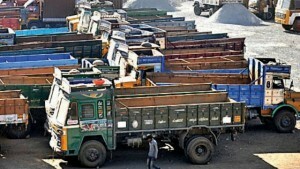 Transporters said easy position of trucks in the market against tight cargo movements, mainly kept freight rates at last levels. Freight rates for nine-tonne pay load section mostly remained steady in the local truck transport market on Monday following sufficient position of trucks against restricted cargo movements. Following are Monday’s freights per nine-tonne load (in Rs): Jaipur 14,000 Hyderabad 50,000 Chandigarh 15,000 Vijayawada 53,000 Ludhiana 17,000 Bengaluru 59,000 Kanpur 18,000 Chennai 60,000 Indore 19,000 Mysore 62,000 Ahmedabad 20,000 Puducherry 64,000 Baroda 23,000 Coimbatore 67,000 Patna 23,000 Kochi 70,000 Surat 25,000 Thiruvananthapuram 78,000 Mumbai 27,000 Goa 50,000 Pune 28,000 Gwalior 11,500 Kolkata 30,000 Guwahati 54,000.